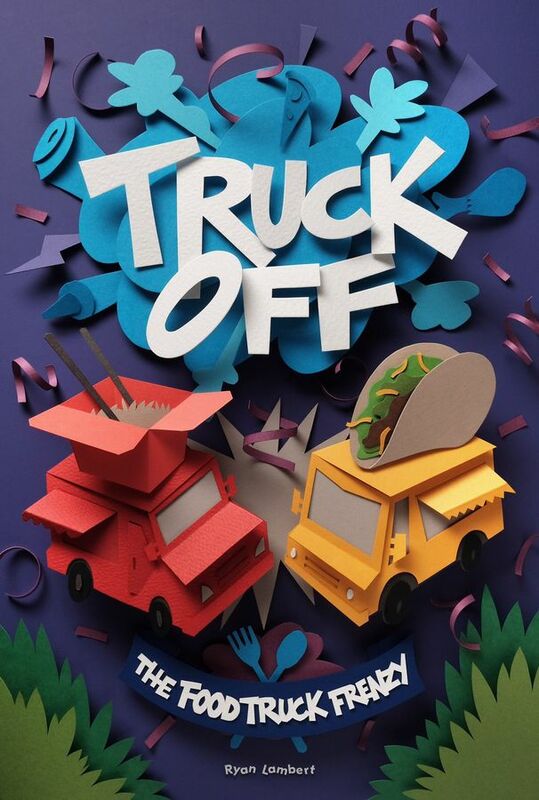 Truck Off: The Food Truck Frenzy is a game by Ryan Lambert, published by Adam’s Apple Games. It is for 2-6 players. In this game, players take on the role of food truck owners as they send their food trucks to different venues in an attempt to haul in as much money as possible. Of course their rivals will be trying to do the same thing and may find a way to get either their food truck or the venue shut down keeping them from earning any money. In the end, the player that can navigate the venues and earn the most money will be declared the winner. To begin, a number of Venue Tiles are placed in the middle of the play area in a row. The specific tiles used are determined by the number of players. The corresponding Venue Die is then placed onto each tile. Each player chooses a food truck and is given the corresponding set of Action Cards and Food Truck tokens. 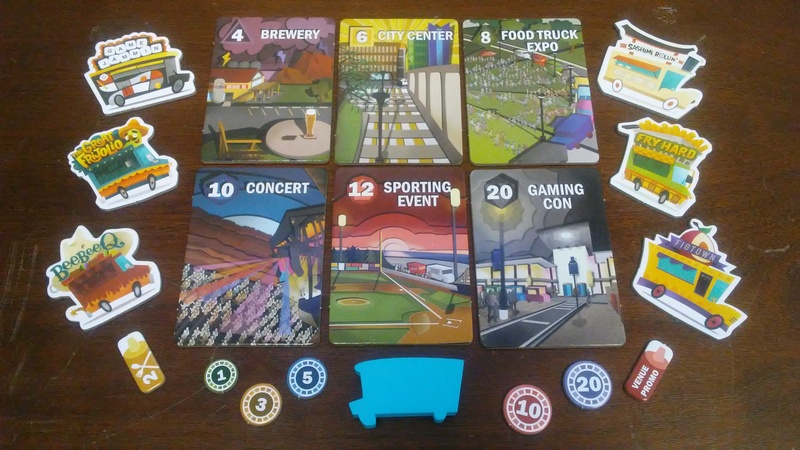 If a specific Venue Tile is not being used due to fewer players, then each player will remove the Food Truck tokens that have those numbers on the back of them. Players will also discard the same 2 Action Cards from their stack based on whether they want to play a game with more or less of the “Take That” mechanic. The Money Tokens are placed into corresponding piles. The Round Tracker Card is placed near the middle of the play area and a 1 money token is placed on round 1. The first player is chosen and is given the first player token. Play now begins. The game is played over 5 rounds. Each round consists of 5 steps; select trucks, roll dice, select actions, execute actions and resolve payouts. The first step is to select trucks. To do this, each player will secretly choose 2 of the venues that they wish to sell their food to for the round. They will place their 2 food truck tokens with the corresponding numbers on them in front of themself with the number side face down. Once everyone has chosen 2 food trucks, all players will then reveal their numbers and will place their token below the corresponding venue in a row. For the next step, the die for each venue will be rolled once. The number rolled equals the total venue payout in money. In the third step, players will select actions. This is done simultaneously. Each player will choose any of their action cards that they wish to play for the round. These cards are placed in the player’s hand, while the any unchosen action cards are placed face down on the table in front of them with their inactive food truck tokens placed on top of them. Once players have completed this step, it’s time to move on to the fourth step; execute actions. In this step, each player in turn order will reveal one of the action cards from their hand and will complete the action described on it. Once the action has been completed, the player will place the action card into their discard pile. It should be noted that a player may choose not to execute an action on one of their action cards. In this case, the player may simply discard the card instead of using it. This continues with each player playing action cards until all of the players have used all of the action cards in their hand. If a player has no action cards remaining in their hand, they must pass until all players have used each of their action cards. The final step is to resolve payouts. For this step, each truck at a venue will earn an even payout that is equal to the total venue payout divided by the number of trucks. For example: if a venue has 3 trucks an the venue die result is a 6, then each truck would receive 2 money tokens. If there are any payout reminders, these are discarded at this time. Once each venue’s payout has been resolved, each player will take back all of their food truck tokens and any game play tokens. The first player token is then passed to the next player in turn order and a new round begins. The game continues until the end of the fifth round. Once the last round has been completed, players will add up all of their money. The player with the most money is the winner. The game comes with a lot of different pieces. First off there’s a bunch of small punchboards inside the box. These contain all of the cardboard pieces for the game including food truck tokens, venue tiles, money tokens and game play tokens. Each cardboard piece is fairly thick and durable. The food truck tokens have a venue number on the back and a specific look for each of the 6 different player’s trucks. There’s Game Jammin, Sashimi Rollin’, Figtown, BeeBeeQ, The Great Frijolio and Fry Hard. Each one has a very unique look which also makes it’s way onto the player’s action cards in terms of flavor text. The money and game play tokens are double sided but have the same image on both sides. The game play tokens look like little ketchup and mustard bottles which is pretty darn cool. The venue tiles have some unique artwork that reminds me a bit of the artwork in the game Suburbia. It’s not very detailed but gives a real feel of what the venue is supposed to be. The game also comes with a fairly good sized stack of cards. There are action cards that correspond with the player’s food trucks and have the same stylized coloring and designs on them. There’s also a stack of Daily Specialty cards which add a bit of depth to the game but don’t have any real artwork to them. These are kind of like event cards and affect their corresponding venue when they take effect. The final pieces are the colored venue dice and the wooden first player token. The dice and Daily Specialty cards have somewhat similar colors to let you know which venue they belong to while the venue tiles have a dice icon on them showing which die belongs with it. The first player token is kind of a teal blue food truck. Based on the look of the game box, I honestly thought that the game was going to be a bunch of paper craft trucks or something. I thought, “man, I hope I’m up to the task of putting these things together.” Thankfully the components were not paper craft so there was no assembly needed. I rather like the images and the artwork for the game. It’s very minimal but fits in quite well with the overall design of the game. Overall I think it’s a much better looking game than what the actual box cover makes you think is gonna be inside. I’m fairly pleased with the look and feel of this one. The rulebook for this game is fairly well designed and is quite easy to read. The text is a bit larger than most rulebooks of this size so it’s easy for those with vision trouble to see fairly easily. There’s a good amount of pictures and examples throughout the book, which is quite helpful. The book does a fair job of explaining the setup process, as well as providing a step by step overview of a round of play. Each step is explained rather well. The rules also include the Daily Special variant which adds in the Daily Special cards which I described a bit more in detail in the components section. There’s also special rules for playing with only 2 players, which add in a 3rd artificial player. The back of the book contains a list of action cards and explains what each one does. This is a rather nice reference to have on the table when playing the game. It’s actually quite helpful. I did find one small issue though. On the back, the action cards that are supposed to be low in the “take that” mechanic are shown as Place Another Truck and Trigger a Venue Payout. In the the setup rules, it shows Promote a Venue and Trigger a Venue Payout. I’m not really sure which one is correct so I played a couple of games one way and the rest the other. Hopefully there will be some errata or a revised rulebook to fix this. Overall I’d say that for the most part, the rulebook gets the job done and that it doesn’t take very long to read. Apart from the small mistake, it’s not bad. This is a fairly simple game to play. You decide where you want to send your food trucks to try and make some money. You all reveal your decisions at the same time and then you roll the die for each venue. That tells you how much money is available at each venue. The bigger the die, the more chance for a higher number to be rolled. Next you decide what cards from your hand that you want to play to affect everything from yours or another player’s truck to the venue itself. Each player has the same cards in their hands, just with different thematic names on them, so you pretty much know what could potentially be played against you. It’s then time to start using those cards to see what happens. This is where the majority of the action takes place. Things can get a bit chaotic in this step. You really never know what’s going to happen. For this reason I feel that there’s a good bit of luck involved with the game. Once all the action cards are played, it’s time to pay off each truck at the venue. Lather, rinse, repeat for 4 more rounds. As I said, pretty simple. So depending on which way you choose to play, the game can have a high “take that” feel to it or a low one. It really depends on which cards you choose to eliminate during setup. Even with a higher feel, it’s still not nearly as harsh and nasty as most of the games I’ve played with a “take that” mechanic. Still the game is pretty solid and can be quite fun with the right player count. The old adage of the more the merrier is very appropriate here. With fewer players it’s not quite as fun. I am especially not too crazy about using the artificial player for 2 player games. You really need at least 3 or 4 players if at all possible. It’s not that the AI for the artificial player is bad, it’s just more fun with real players. For one thing, real players laugh and that’s what will happen quite a bit while playing this game. When trucks start getting moved around and then moved around again. You can find yourself getting a good case of the giggles. My daughter loved when I was about to get a good payday from one of the venues and she played an action card that moved my truck to a much smaller payout. The game also excels in simultaneous action selection. In this way, it makes me think of the game The Grimm Forest, which is one of my daughter’s favorite games. Needless to say, this is a rather good game. Fans of games with the Take That mechanic like Flaming Pyramids, Munchkin and The Grimm Forest should enjoy this one as well. It’s family friendly and one that even the younger players can enjoy. It’s a good game that I recommend giving a try. Truck Off: The Food Truck Frenzy is a simultaneous action selection game of take that where players try to make the most money from their fleet of food trucks. The game isn’t a very long one. In fact, most game sessions last around 30 minutes or so. It’s fairly quick and light enough that most players of every age can play. The components are very good. I especially like the uniqueness of each player’s deck of action cards and the flavor text on each one. The rulebook has a minor error or two but nothing too major as to cause a lot of problems. Hopefully there will be some errata or something to clarify the issue posted to fix this. As for the game itself, it’s a good game that is family friendly. The take that mechanic is variable and can be added or subtracted from the game to make it perfect for players that prefer light or heavy player interaction. Regardless which level is chosen, the take that mechanic doesn’t feel as mean as in other games of the same type. Fans of the mechanic, as well as those that enjoy simultaneous action selection games, should enjoy this one as well. Fans of games like Flaming Pyramids, Munchkin and The Grimm Forest should find something to like with this one as well. This is a game that I would recommend giving a try. Like the perfect menu, there’s something very everyone to enjoy. For more information about this and other great games, please check out Adam’s Apple Games at their site. 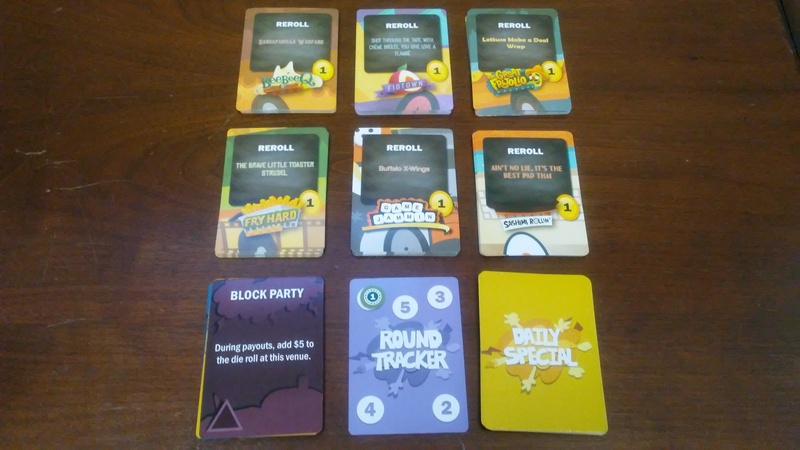 This entry was posted in Reviews and tagged adam, adam's, adam's apple games, apple, board, board games, card, card games, food, food truck, food truck frenzy, frenzy, games, lambert, off, ryan, ryan lambert, truck, truck off. Bookmark the permalink.